Okay, so the Diamondbacks aren’t in Ohio. But two of the three teams involved in today’s mega-deal are! Fans of both the Cleveland Indians and Cincinnati Reds must be feeling pretty good about the moves they made. The Indians finally found a good fit for star outfielder Shin-Soo Choo, but even they might end up surprised with the return they got on the investment. And Choo’s new team, the Reds, are clear favorites to repeat in the NL Central after adding a quality bat and glove like his. And the middle child, Arizona, is stuck with the biggest question mark. Luckily for them, their guy also may net the biggest return. However, the ultimate prize for the D’Backs may be that with a shortstop added to the mix, Justin Upton will be staying put in the desert. Will the other, secondary players in this trade make an impact down the road? This writer sure thinks so. Wow, that’s a doozy. The first thing that stands out to me when breaking down this trade is the ultimate haul of ridiculous talent that ends up in Cleveland. Though Stubbs hasn’t quite lived up to his billing in Cincy – mostly due to a high strikeout rate – he’s extremely gifted. I’m talking speed, power and defense in a combination that few players can match. Even if he struggles to acclimate to Cleveland and continues to fail at getting on base, I think the Indians have a very workable project with Stubbs, who is still young and has a very high ceiling. He should fill in nicely for Choo for the time being. 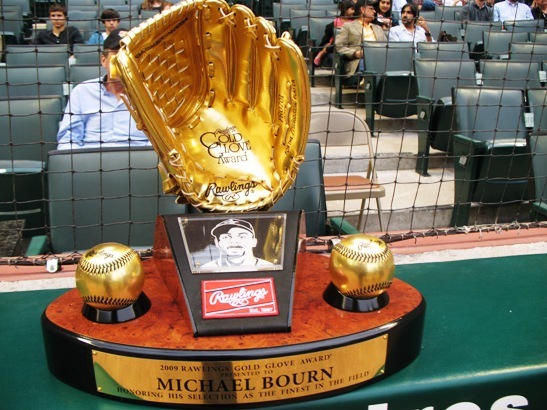 The real prize has to be Bauer, a top pitching prospect who is considered among the best in baseball. I’m a little bit surprised the Diamondbacks parted with him over Tyler Skaggs, but I’m not one to question that brilliant front office. Bauer brings power, wisdom and accuracy to the mound. At the ripe young age of 21, Bauer is under team control for a long time and should blossom into a star, barring injury. Throw in the fact that Cleveland landed two right-handed relievers under age 3o, and they might just win this whole darn thing. Matt Albers, 29, has a 2.57 ERA last season between the Blue Jays and Diamondbacks, and Shaw, 25, put up pretty good numbers as well. Over in Cincinnati, the Reds have found a full-time center fielder. One has to wonder if that will backfire, given that Choo has only played 10 games there in his whole career. That being said, the outfield is all the same – center field commands more of a range, but if you can catch a fly ball and throw a runner out, you can do it well from anywhere out there. Personally, I think Choo will figure it out pretty quick and be an above-average center fielder. And never fear, Reds fans. Choo is most likely a one-year stop-gap before uber-prospect Billy Hamilton reaches the Majors for good in 2014. Adding in Donald isn’t extremely noteworthy, but he’s a good utility man who can provide a spark off the bench across multiple positions – or fill a potentially-vacant role at third base. In Arizona, fans might be wondering why their team moved one of the best minor league arms in baseball for a guy named Didi. But one look at Gregorius’ tape and stats, and you may be convinced. He is under team control until 2019, and may be that franchise shortstop the D’Backs have been searching for. The stats aren’t anything exceptionally flashy, but they don’t tell the whole story. Multiple analysts rank Gregorius as a plus-fielder and a plus-hitter for average. His nearly 450 games in the minors so far have produced a .271 career average and respectable fielding numbers. If Gregorius lives up to the enormous potential he possesses, the D’Backs may have gotten the biggest steal of the whole trade. And don’t forget they got Sipp and Anderson too. Sipp has a career 3.68 ERA, but is just entering his prime. Anderson is also under team control until 2019 and could very well blossom into a power-hitting, left-handed first baseman. As it stands now, the Reds definitely win in the short-term with this trade. In the long run, I like what the Indians got. And the dark horse Diamondbacks will need all three players to really pay off if they want to even be considered as winners of this deal. But enough of my opinion – what do you think? Tell us who won the trade by voting and commenting below – for more back-and-forth, follow @3u3d or like Three Up, Three Down on Facebook.